Sophomore Christian Williams figures to get first chance to run the Hawkeye offense, but what about Bohannon and Jok? If you looked closely at the Iowa men’s basketball team’s final five games last season, you might have glimpsed the point guard of the future. Freshman Christian Williams didn’t play much, but the fact that he got onto the court at all was a testament to how much he improved during practices late in a 22-11 season, coach Fran McCaffery said Friday before a Coaches vs. Cancer charity event in Des Moines. Williams was so timid early in his freshman season that he didn’t even play the first time Iowa met Indiana. In the rematch, he scored eight points in 12 minutes, with three offensive rebounds, one assist and no turnovers. Williams played 24 minutes in the final four games, with eight points, four rebounds, two assists and two turnovers. That’s not much to go on, but it makes him the most experienced returning point guard for a Hawkeye squad that graduated Mike Gesell and Anthony Clemmons. Incoming freshman Jordan Bohannon of Linn-Mar also figures to be in the mix for minutes at that vital position, but McCaffery opted not to recruit another true point guard, instead using his final scholarship on 6-foot-6 wing player Maishe Dailey this week. Senior shooting guard Peter Jok, if he doesn’t opt to turn pro, may also be asked to take on a much bigger ball-handling role this winter. He played in 20 games a year ago but for a total of only 102 minutes. He scored 27 points, with six assists vs. six turnovers. If that doesn’t exactly inspire confidence, it’s worth noting that his turnover percentage was an acceptable 17.8 (Gesell’s was 19.9 and Clemmons’ 16.8). “His eyes are up, he’s looking for you at all times,” Clemmons said this week of his scrimmages against Williams. “What the coaches want from him is for him to be more aggressive. That’s what’s going to make his game take another step. He won Iowa’s Mr. Basketball award after averaging 25.8 points, and making 42.8 percent of his 3-point shots, as a Linn-Mar senior. At 6-foot-1, though, he projects as a point guard in college. Last year he had 58 assists against 39 turnovers in 23 games. 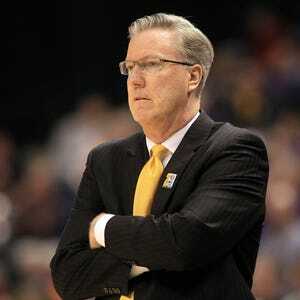 McCaffery said Bohannon will team with Jok to be two of the best 3-point shooters on the team. But the freshman will also be able to be more of a facilitator than he was in high school, where he was the first scoring option for his team and also led it at 5.3 rebounds per game. The 6-foot-6 marksman will never be considered a true point guard, but that doesn’t mean the ball won’t be in his hands a higher percentage of the time. Jok was second on the team in scoring at 16.1 points per game last season. He also was second in usage rate behind the graduated Jarrod Uthoff. Even so, his turnover percentage was just 11.8, to rank 193rd among Division I players. Recruiting: Who are Hawkeye hoops targets for spring and summer? Clemmons advised Hawkeye fans not to worry about what appears to be a position of weakness.